Perhaps the word ‘mediation’ conjures up monks in a temple or yogis sitting cross-legged in the mountains, a super-human task that you don’t have time or the energy to try. But did you know that mediation has been proven to be more effective than morphine at treating chronic pain? More than 76 million people suffer from chronic pain – whether it is from diabetes, heart disease, arthritis, or a host of other physical conditions. The best part – you don’t have to be a seasoned monk to get pain-management benefits from meditating. Brain scans which measure long-term brain processes (arterial spin labeling magnetic resonance imaging [ASL MRI]) were taken of participants who were taught how to practice a meditation technique that lasts for only 20 minutes. 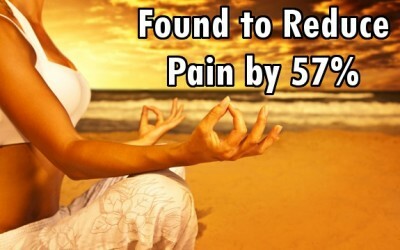 The 20 minute meditation period results in a whopping 57% reduction in pain. In fact, it isn’t just the thoughts that are changed, but the brain structure itself was utterly transformed by meditation. Two types of mediation are in fact, completely rewiring the medical paradigm – mindfulness and transcendental meditation. They each require the practitioner to focus their attention on the present moment – either the breath, an image, a word, a sound, or a mantra. Eventually, the mind is taught to be in a state of ‘relaxed awareness’ instead of jumping from thought to thought, a state called ‘the observer’ by practiced meditators. This state of mind also helps us to be more compassionate and non-judgmental, which lowers our stress – one of the biggest indicators of long-term illness and disease. Meditation also significantly reduced brain activity in the primary somatosensory cortex, an area that is significantly involved in creating the feeling of where and how intense a painful stimulus is. Its time to put away the pills and try to calm your mind. It could reduce your pain while also preventing the unpleasant side effects that come with pharmaceutical drugs. Meditation instead of morphine. Try it.